Set in the time of King Henry VIII, Catherine Percy is on the run. 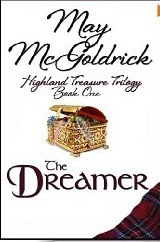 Escaping England, she travels to Scotland under the sanctuary of a Highland earl, John Stewart. A case of mistaken identity, on thing leads to another, and they are both quickly wed. At first I was curious as to how he could mistaken the identity of his betrothed, since they are well acquainted, but once you read it, it all makes sense. What I love about Catherine is she has a brain and knows how to use it, and yes she has her weaknesses, but that's what made her genuine. So happy to not only having a strong female character, but a character I share a name with. It wasn't just Catherine who was a strong female character in this book, but they all were. Which makes is a good change especially for this time period. What really sold this book for me, and the main reason why I got it in the first place, was praise from Nora Roberts. If you have read any Nora Roberts books, you know she writes about love, friendship and family bonds to perfection. So after reading The Dreamer, I wasn't surprised this book had all those similarities. I'm a massive Nora Roberts fan, so whatever she says I listen. I will definitely read the rest of this series, and any other works from this author.